I had a very nice shoot with Thalita. She is a member of the MARS Reenactment association. Check out their Facebook page. MARS is a living history group which keeps military history over several time periods and locations alive. 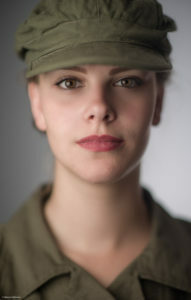 Thalia plays the role of a member of the WAC which stands for Women Army Corps. 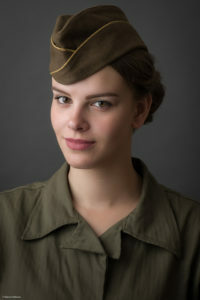 She represents a private rank of the WAC. The WAC is part of the American World War 2 group of MARS. 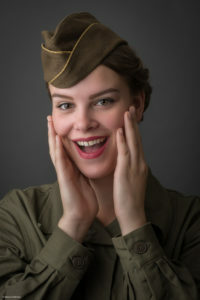 The WAC has been a branch of the United States Army which had women with three major specialities: switchboard operators, mechanics and and bakers. Thalita represents the mechanic speciality. During the shoot I used studio strobes with large light modifiers to create a soft light. Thalita is a great personality and very nice to work with. Thank you Thalita. I had a great time during the shoot.